It is already a well-known fact that every hour the sun beams onto the Earth energy which is more than enough to satisfy the energy needs of the whole world for one calendar year. Unfortunately, current solar technologies are able to capture and utilize as solar power only very small part of this energy (less than one tenth of a percent of the global energy demand). Today, there are two main types of technologies that are used for conversion of sunlight into electricity - directly using photovoltaics (PV), or indirectly using concentrated solar power (CSP). Most of the people are familiar with the so-called photovoltaic cells, or solar panels. The PV cells are made of semiconductor materials like those found in computer chips, and when the sunlight hits the cells, electrons are loosed and flowing through the cell are generating renewable electricity for end consumption. 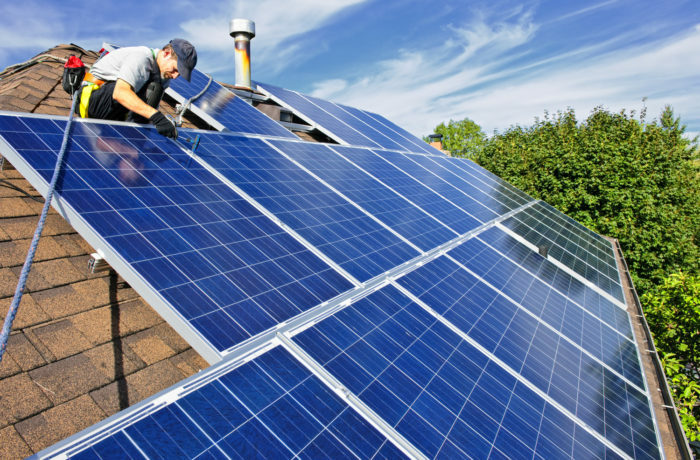 Photovoltaics are commonly used to power small and medium-sized applications, like space crafts, roof-tops or off-grid powered homes where grid connection is inconvenient or unavailable. However, with the continuous falling price of the solar panels, solar power is also increasingly being used for on-grid solutions simply to feed low-carbon energy into the system. On lager scale, usually the concentrated solar power (CSP) plants are used. CSP technology applies various techniques to concentrate (mostly via mirrors) the sun energy, convert it as heat to boil a liquid (usually water), which later is used to drive a stream turbine that generates green electricity for thousands of people. - Simple and quite often the only practical application for rural regions, where grid-connection is not available. During the past 15 years, thanks to the rapidly falling prices, but also positive efficiency gains, solar power did a significant worldwide growth, which for several years was driven by the European market (mostly Germany, Spain, Italy etc. ), but later shifted to countries like China, Japan and United States. At the end of 2013 the total global installed capacities reached almost 140 GW, with Germany having the leadership of almost 36 GW installed capacities and Italy having the highest percentage of electricity generated from solar power plants (7%). In 2014 the International Energy Agency predicted that by 2050 solar power could reach 27% of the global electricity generation, of which 16% will be due to the use of PV technologies and 11% due to CSP. It is already a well-known fact that every hour the sun beams onto the Earth energy which is more than enough to satisfy the energy needs of the whole world for one calendar year. Unfortunately, current solar technologies are able to capture and utilize as solar power only very small part of this energy (less than one tenth of a percent of the global energy demand). Today, there are two main types of technologies that are used for conversion of sunlight into electricity - directly using photovoltaics (PV), or indirectly using concentrated solar power (CSP). Most of the people are familiar with the so-called photovoltaic cells, or solar panels. The PV cells are made of semiconductor materials like those found in computer chips, and when the sunlight hits the cells, electrons are loosed and flowing through the cell are generating renewable electricity for end consumption. Photovoltaics are commonly used to power small and medium-sized applications, like space crafts, roof-tops or off-grid powered homes where grid connection is inconvenient or unavailable. However, with the continuous falling price of the solar panels, solar power is also increasingly being used for on-grid solutions simply to feed low-carbon energy into the system. On lager scale, usually the concentrated solar power (CSP) plants are used. CSP technology applies various techniques to concentrate (mostly via mirrors) the sun energy, convert it as heat to boil a liquid (usually water), which later is used to drive a stream turbine that generates green electricity for thousands of people. Some of the benefit to use more solar power: - It is inexhaustible and resourceful source; - It is clean and renewable; - Pollution and noise free; - Versatile technology – applicable with handheld calculator, cars, buildings and even out of the Earth satellites; - Simple and quite often the only practical application for rural regions, where grid-connection is not available. During the past 15 years, thanks to the rapidly falling prices, but also positive efficiency gains, solar power did a significant worldwide growth, which for several years was driven by the European market (mostly Germany, Spain, Italy etc. ), but later shifted to countries like China, Japan and United States. At the end of 2013 the total global installed capacities reached almost 140 GW, with Germany having the leadership of almost 36 GW installed capacities and Italy having the highest percentage of electricity generated from solar power plants (7%). In 2014 the International Energy Agency predicted that by 2050 solar power could reach 27% of the global electricity generation, of which 16% will be due to the use of PV technologies and 11% due to CSP.